Brisbane June/July 1977 – Clarinettist Andy Jenner of the Vintage Jazz Band forms another band “to play mouldy jazz in an old hall”. Personnel are: Trumpet – Ian Oliver, former member of the original Varsity Five; Trombone – Peter Rex; Piano – John Hall; Banjo – John Reid; Sousaphone – Jack Connelly, formerly of the Frank Johnson band; Andy wants a washboard player, but does not know one at this stage. Andy and his then wife Meg are involved with the Baroona chapter of the state ALP, whose headquarters is the 1880s vintage Baroona Hall in Caxton Street in the suburb of Petrie Terrace. A recent photo can be seen right. History of the hall, an early sketch, and more photos dating back to the early 1900s can be seen here. This is to be the venue of the “Caxton Street Jazz Club”, which will operate on Friday and Sunday nights. The ALP will operate the bar and take the profits. The band will be paid from door takings. Andy can’t think of a better name for the band than “Caxton Street Jazz Band”. Andy, clever fellow that he is, builds an electric sign that spells out “Caxton St Jazz Club” with a flashing arrow that points to the entry – in the lane between the hall and the Prince Alfred Hotel (now the “LA”), which is on the corner of Caxton St and Petrie Terrace (the street). (Not long after a truck ripped the sign half off the wall. The sign remained hanging there well into the 80s, long after the demise of the CSJ Club – a tribute to the quality and longevity of Andy’s craftsmanship). 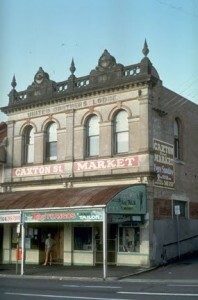 The Caxton St Jazz Club opens on 24 July 1977, and the band’s first tune is “I ain’t gonna give nobody none of this jelly roll”. A large crowd attends and greets the new band enthusiastically. Bob Mair, present leader and long-time member, is in the audience. As John Hall has a regular gig on Friday nights, Andy invites Bernice Haydock from Toowoomba to play piano on Fridays, with John playing on Sundays. Bernice, the sister-in-law of John’s business partner, has been singing with Toowoomba’s Windy City Jazz Band. She is a classically trained pianist with a recently-acquired interest in jazz. Her first gig with the band was probably Friday 29 July 1977. Meanwhile Bob Mair, having followed the Vintage Jazz Band for several years, finally sits in on drums with the Vintage at the 12th Night Theatre Club. Bob hasn’t played for a number of years, but has never lost his passion for jazz. The Vintage enjoy his drumming style, and one night at the 12th Night Club, shortly after the CSJB has started playing, Andy asks Bob if can play the washboard. Bob says he never has but probably could, but doesn’t have one. Andy has several, and lends Bob a washboard and some metal thimbles. Bob goes home and has a go, reckons he can do it, and fronts up to the next CSJB gig, probably Friday 4/8/77. He sits in for the night, and Andy asks him to join the band. Shortly after, Andy asks Bernice to play on both Friday and Sunday, and John Hall leaves the band.